Join us in being all in, as we embark on this important journey for the future of St. Elizabeth Ann Seton. Our goal is to move forward with the construction of Phase 1 as soon as the funds are raised. With a capital campaign goal of $2.3 million, gifts at all levels are welcome and appreciated. The campaign will ask for a commitment of contributions over a period of three years. We need your prayers and your support as we move forward in this next chapter of our story. Your generous contribution will provide the support we need to ensure that St. Elizabeth Seton parish will continue to serve the needs of our local Catholic community for years to come. Please consider giving to the All In: Give To Grow campaign for Phase 1 of the growth of your faith community. Your gift today will have a lasting impact for years to come. Through a feasibility study conducted by Charitable Giving Resource Center (CGRC) and the research of SVPA Architects, a number of parish needs were identified. Based on this study, St. Elizabeth Seton parish has a vision to build a new parish hall which will seat 250-300 with an appropriate sized kitchen. Also included is a new worship space to seat 400 people with a suitable sized gathering space. New and enlarged restrooms are envisioned to support these functions. 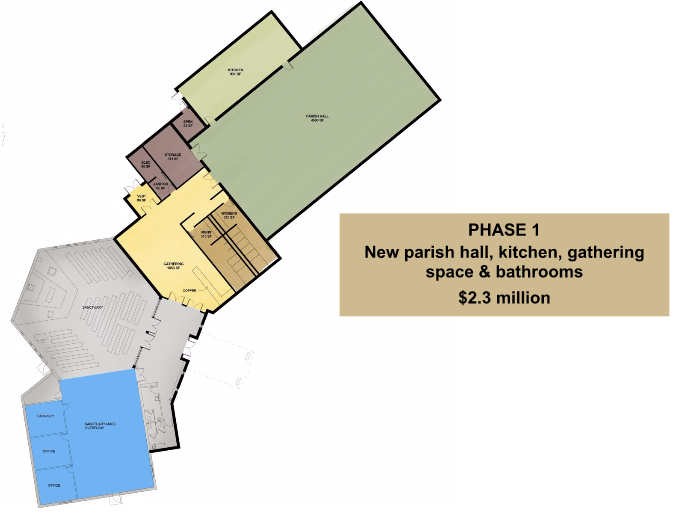 With the remodeling of the existing facility, the parish has a vision of re-purposing the existing parish hall and worship space into new classrooms and office space, bringing all the facilities under one roof. A new image for the parish is envisioned as the exterior of the existing building is transformed into a new and appealing building, highlighted by a dramatic worship space facing Scotch Ridge Road. The research clearly demonstrates that in its current state, our facilities are limiting our ability to worship, learn and congregate as a faith community and serve the Carlisle area community. After careful analysis, both studies concluded the highest priority for the parish, as determined by the parishioners is a new parish hall, which will be built in Phase 1, with Phase 2 to be pursued after the successful completion of Phase 1. This phased approach will allow St. Elizabeth Seton to conduct the expansion over time as funds are raised. 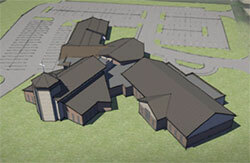 Phase 1 will include the construction of a new parish hall, including a larger kitchen and additional bathrooms. Phase 2 will include the addition of a new sanctuary and converting the existing sanctuary for other uses, such as youth ministry or meeting space. Phase 3 will include new classrooms as well as furnishings and equipment, in what is currently the parish hall and kitchen. Phase 4, if needed, will include a classroom addition, along with furnishings and equipment. We have arrived at a moment where it is necessary to address the needs, hopes, and possibilities for our parish. Moments like these for a parish are fleeting and a certain commitment is needed to embrace a strategy and plan to help the parish community of St. Elizabeth Seton to thrive both now and in the future. As those faithful and resilient founders demonstrated in erecting this parish, it is now on the current parishioners to share that same sense of hope, commitment, and dedication to St. Elizabeth’s vibrancy and presence in this community. We are ready to move forward in the right direction to raise funds to build a new space to gather, worship, learn, and celebrate. Will include the construction of a new parish hall, including a larger kitchen and additional bathrooms. Will include the addition of a new sanctuary and converting the existing sanctuary for other uses, such as youth ministry or meeting space. Will include new classrooms as well as furnishings and equipment, in what is currently the parish hall and kitchen. If needed, will include a classroom addition, along with furnishings and equipment. From monetary donations to stock and bond gifts, there are several ways to give. Please consider giving.